One of the many mysterious elements in the origins of the Hermetic Brotherhood of Luxor is the role of Hurrichund Chintamon as an advisor to its founders Burgoyne and Davidson. In Photography: an Illustrated History, Martin W. Sander writes “The early popularity of photography in India, particularly in Bombay, was also due in great measure to the contribution of one pioneer photographer, Hurrychind Chintamon…the most masterful and most successful of the early Indian photographers who captured carte-de-visite images of literary, political, and business figures, Chintamon’s most famous carte was a portrait of the Maharaja of Baroda. Thousands of these images were distributed throughout India.”(p.32) An online history of photography in the Indian subcontinent explains that Elphinstone College in Bombay began to offer instruction in 1855, “where classes consisting predominantly of Indian students were introduced to a wide range of photographic processes. 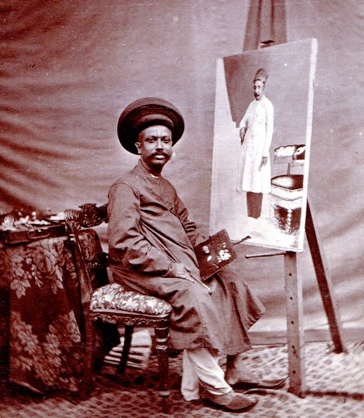 Among the graduates of these classes was Hurrichund Chintamon, who thereafter established a successful studio in Bombay which survived until the 1880s.” Chintamon left a tremendous photographic legacy of which traces are found on the Web. Both of these maharajas did in fact support the TS, presumably through Chintamon’s influence. Mahatma Letter #54, allegedly from Koot Hoomi, refers to “the man who robbed the Founders and Dayanand of Rs. 4,000, deceived and imposed upon them from the first (so far back as New York), and then exposed and expelled from the Society ran away to England and is ever since seeking and thirsting for his revenge.” (Mahatma Letters, p. 306.) But in 1878, before meeting him, in an article “A Society Without a Dogma” HPB referred to “the famous commentary on the Bhagavad-Gita of our brother Hurrychund Chintamon”, and quotes him to the effect that “In Hindustan, as in England, there are doctrines for the learned, and dogmas for the unlearned; strong meat for men and milk for babes; facts for the few, and fictions for the many, realities for the wise, and romances for the simple; esoteric truth for the philosopher, and exoteric fable for the fool.”(Blavatsky Collected Writings, I:306) Within a few years Chintamon would accuse Blavatsky of adding to the stock of Indian fictions and fables, and produce documentary evidence that supported his accusation. Only the weak need a crutch. There is no primal truth in Earthly writings outside the Vedas: all else is derivation. If you seek consolation seek it there; if support it is there to be found (or something to that effect—you know better what to say.) The reality of the Word made Flesh is to be found in humanity—The highest avatar of the Son. Have patience & work for your fellow creatures and you will see Light in the East. A true Theosophist of the Arya Samaj will not wait in vain. Massey and Kislingbury were the President and Secretary of the British TS. Blavatsky had found Olcott easily persuaded by letters from adept authority figures, and clearly hoped that Massey and Kislingbury would become equally devoted to Theosophy on the same basis. Dayananda had no interest in Mahatma letters and ended up denouncing Blavatsky and Olcott for their involvement in such phenomena. But instead of alerting Dayananda to the nature of the dubious requests made by HPB, Chintamon seems to have kept him in the dark. In November 1880 when Mahatma correspondence between Koot Hoomi and A.P. Sinnett was inaugurated, Dayananda was apparently taken by surprise and felt betrayed by this development. He wrote to her “Madame Blavatsky…whatever you had written to me from America, or discussed with me at Saharanpur, Meerut, Kashi, etc….does not seem to conform with your present activities.” (Autobiography of Dayanand Saraswati, p. 68) Chintamon himself lent a hand with HPB’s schemes to impress Massey, however. Olcott and HPB stopped in London in early 1879 en route to Bombay from New York, and during this visit they saw Massey at the home of a mutual friend, the medium Mary Hollis-Billing. As told by Marion Meade in Madame Blavatsky, “after dinner, at Mary’s instigation, Helena fished around under the table and `materialized’ a Japanese teapot and later, as Massey was preparing to depart, she told him to reach into his overcoat pocket. To his amazed delight, he withdrew an inlaid Indian cardcase containing a slip of paper that bore Hurrychund Chintamon’s autograph.”(p. 194) In 1884, after meeting Chintamon and hearing his account of his dealings with the TS, Massey announced his resignation as British TS President in the journal Light, writing “The evidence for the existence of Adepts — or “Mahatmas,” since that term is now preferred — and even of their connection with individual members of the Theosophical Society, need not here concern us. We may, and I do, accept it; and yet see in their methods, or rather in the things that are said and done in their names, such deviations from our Philistine sense of truth and honour as to assure us that something is very wrong somewhere.” By contrast, Kislingbury was one of the dozen members of Blavatsky’s Inner Group formed in 1890 and continued to be a Theosophist after the death of HPB. According to the compilers of The Hermetic Brotherhood of Luxor, Chintamon was in England from 1879 or 1880 through 1883. The Reverend William Alexander Ayton, an early member of the HBofL “claimed very clearly and repeatedly that he had proof of Burgoyne’s being in company with Chintamon.”(HBofL, p. 35) This has led to confusion, because T.H. Burgoyne worked for a time as Max Theon’s medium or seer and it was mistakenly thought that Theon was Chintamon. As their photographs and historical documentation indicate, they were quite distinct individuals, but both had some association with the leaders of the HBofL. Theon and Chintamon were both former associates of Blavatsky who became mentors of Burgoyne, which is part of the complicated relationship between the HBofL and the TS. Next month’s blog post will feature another man who served as the first intermediarybetween the TS and the Arya Samaj, American Spiritualist leader James M. Peebles. What can we conclude from the brief involvement of Chintamon successively in the Arya Samaj, the TS, and the HBofL? Any simple classification of 19th century occultists as heroes and villains is confounded by this episode. Olcott and Dayananda both entered into the TS/Arya Samaj affiliation in good faith, believing what they were told by HPB and Chintamon respectively. But HPB and Chintamon both acted in bad faith for different reasons and in different ways. Since Dayananda could not read English and the TS founders could not read Hindi, by acting as an intermediary Chintamon had the power to shape each group’s perception of the other. In his enthusiasm to promote the alliance he portrayed each group as being more compatible with the other in goals and beliefs than they actually were; it took several years for the resulting confusion to work itself out in a series of conflicts as Dayananda got better acquainted with Olcott and HPB. HPB approached the situation in bad faith in that her words indicated vast respect for the Swami as a spiritual teacher, yet at the same time she was concocting Mahatma letters to manipulate and deceive her closest supporters in England and intending that the Swami legitimize this fraud by signing the letters. Chintamon was a whistle-blower in his role as informant to Richard Hodgson, as well as in his involvement with the HBofL founders. One of the greatest influences of his exposure of the 1878 correspondence with Blavatsky is that it drove a wedge between her and Olcott. When Hodgson repeated to him some of the disparaging statements that she had made to Chintamon about Olcott’s credulity, the Colonel was so despondent that he contemplated suicide by drowning. He steered a more independent course thereafter. Whether motivated by revenge or a guilty conscience, Chintamon provided evidence that persuaded the SPR of the fraudulent nature of the Mahatma phenomena. But his attitude was not simply destructive towards the TS; apparently he also wanted to help bring about an alternative that would not be based on Blavatsky. Burgoyne’s writings evince a strong anti-Theosophical bias, and this antagonism was likely encouraged by Chintamon’s revelations. The compilers of the HBofL conclude that in England “Chintamon allied himself with the rising Western opposition to esoteric Buddhism exemplified by Stainton Moses, C.C. Massey, William Oxley, Emma Hardinge Britten, Thomas Lake Harris, and others. From this formidable group, Burgoyne first contracted his hostility to Blavatsky’s enterprise that would mark all his writings.”(HBofL, p. 36) But Chintamon was also the source of genuine Sanskrit learning, and thus was able to serve as an instructor to Burgoyne on Hindu occultism. When Elbert Benjamine took on the task of reformulating the HBofL teachings as the Brotherhood of Light lessons, he was faced with a legacy of extremely discordant 19th century occultist sources many of whom considered one another enemies. To a remarkable degree he succeeded in creating an integrated harmonious teaching free of sectarian antagonisms. Blavatsky was always treated with friendly respect in his writings and no one is ever vilified in 20th century CofL sources in the manner found in TS and HBofL literature of the 19th century. Now, a century since Benjamine accepted the task of systematizing and restating the Hermetic teachings, we can look back at the 19th century origins of the Church of Light with sympathetic respect for all the conflicting players in the drama. Heroes, villains, mistakes, quarrels, revenge—all standard elements in any melodrama—make the story intriguing, if not always inspiring. But there were genuine spiritual inspirations and aspirations mixed up with all the international intrigue, and the closer we examine any of the major characters in the story the more apparent this becomes. Additional comment: this post was recently doubly misconstrued as “Church of Light bashes Blavatsky” which requires two emphatic disclaimers on my part. The content of blog posts here is entirely my own and no one in the Church of Light reviews them in advance or necessarily agrees with them. The Church of Light is not the Hermetic Brotherhood of Luxor, 1884-1909. It is not the Earlier Theosophical Society, 1875-1878. It is not a Hermetic lodge in Alexandria, circa 150. Yet it is in various ways the heir of all three of these extinct organizations, as well as now-extinct nineteenth century groups labeled Rosicrucian, Spiritualist, and Masonic. No one is ever bashed in any Church of Light publication, as in the twentieth century this group did not engage in the kind of polemics that its nineteenth century predecessors enjoyed. In the twenty first century, I hope we can look back at the various feuding players of those predecessor organizations without special pleading on behalf of any of them, or the attitude that they can be sorted into mutually exclusive columns of heroes and villains.